See that woman in the image at the top of this post? She’s so comfy under that weighted blanket that she fell asleep sitting up, it would seem. I’ve never tried a weighted blanket myself, but so many people are obsessed with them these days that I’ve been planning to give them a try. 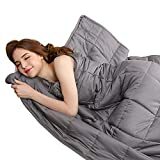 Guess what: today is the day I’m finally pulling the trigger and getting one, because Amazon is running some of the best deals we’ve ever seen on top-rated weighted blankets. The BUZIO 15 lb 48” x 72” Weighted Blanket typically costs $69, but the coupon code UAMIYVWA slashes that price all the way down to $51.99. Use the coupon code VHIUOGGT to get the $84 BUZIO 15 lb 60” x 80” Weighted Blanket for $58.99, and the heavier BUZIO 20 lb 60” x 80” Weighted Blanket that normally costs $97 can be yours for $69.99 if you use the coupon code V3ZUTOPP at checkout. These deals won’t last long, so get in on the action while you still can. Perfect Gift Idea: A good Thanksgiving and Christmas’ gift for you and your loved ones, it is a warm and partial housewarming or family gift. Only one Weighted inner layer included, without removable cover. A Removable Duvet Cover is Highly Recommended for Easier Cleaning（sold separately). Please Search BUZIO Duvet Cover to Find Correponding Cover for your Heavy Blanket. Breathable and Natural: the weighted inner layer is made of 100% high quality organic cotton, soft and skin-friendly; and the weighted filling is environmenta, durable, hypoallergenic, odorless and non-toxic glass beads. Right Weights and Size: Weighted blankets are engineered to 7%-12% of your body weight to ease the nervousness and help you fall asleep faster. This adult weighted blanket weighs 15 lbs, perfect weights for the individuals above 140lbs. It measures 60 x 80 inches, perfect size to hug you back throughout the night. New Process – The new process can make the square much smaller, which would make weight distributed evenly inside the blanket. The updated process would fix the problem that the glass beads move massive around inside the blanket. To prevent the glass beads leakage, we add two layer microfiber inside, which is also breathable and warm. Care and Guarantee: You can buy both BUZIO‘s removable duvet cover (sold separately) and inner layer for easier cleaning, since weighted blanket is so heavy to wash. Moreover, you will get friendly customer service and 12 months warranty from BUZIO. Only one weighted blanket inner layer included, without removable cover. Right Weights and Size: Weighted blankets are engineered to 7%-12% of your body weight to ease the nervousness and help you fall asleep faster. This adult weighted blanket weighs 20 lbs, perfect weights for individuals around 120 to 150 lbs. It measures 60 x 80 inches, perfect size to hug your back throughout the night. Breathable and Natural: the weighted inner layer is made of 100% high quality organic cotton, soft and skin-friendly; and the weighted filling is durable, hypoallergenic, odorless and non-toxic glass beads, simulating the feeling of being held or hugged. No more tossing and turning and much faster to shut down and fall asleep. Perfect Gift Idea: A good Thanksgiving and Christmas’ gift for you and your loved ones, it is a warm and partial housewarming or family gift. BUZIO weighted blanket offers great all-natural sleep help for adults and kids by offering the gentle sensation of being held to encourage deep, healthy, restful sleep, always help you to relax and even get a relaxing nap in when you want to. Care and Guarantee: The weighted inner layer is machine-washable on a low, gentle setting. You can buy both BUZIO‘s removable duvet cover and inner layer for easier cleaning, since weighted blanket is so heavy to wash. Moreover, you will get friendly customer service and 12 months warranty from BUZIO.